Patients whose blood pressure exceeds 160/90mmhg – 160 for systolic (heart contraction) and 90 for diastolic (heart relaxation). This is after taking three or more medications have failed to deliver an effective drop in blood pressure. Hypertension is diagnosed when a patient’s blood pressure exceeds 140/90mmHg. 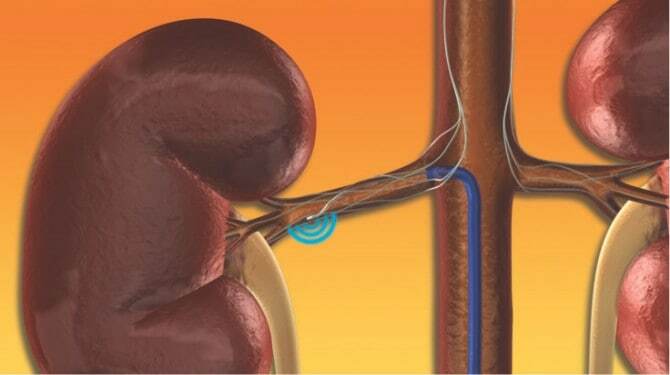 Renal Denervation (RDN), or Ardian, is a catheter-based (insertion of a “tube”) procedure that uses radiofrequency waves to interrupt the supply of overactive sympathetic nerves running along the renal arteries – around the kidney area – in order to reduce blood pressure. The minimally invasive procedure takes an estimated two hours to complete under moderate sedation. Studies have shown a reduction of around 32mmHg systolic and 12mmHg diastolic in patients with an initial blood pressure greater than 160/90mmHg following a six-month period. The effects for RDN are known to last for a long time after the treatment.